It is a known fact that there are hundreds of species in bamboo and Nature has bestowed China with more than 500 varieties. The Chinese people have been fully utilizing this Nature's gift and have become experts in making many objects of utility and artistic expression with bamboos. The age-old craft of bamboo basketry is a marvelous art in which flexible bamboo materials are woven, coiled and sewn to make vessels and many other attractive and useful items. Relics of of the periods of Liangchu Culture speak a lot about this art. These relics prove that ancient Chinese were making crude huts, dresses, granaries, boats, utensils including water and cooking utensils, etc. using the art of bamboo basketry. Even now, daily articles like utensils, shoes, caps, mats and those for entertainment and cultural use are made with this art. These products are exported also to many other countries. Every region of China has its own regional flavor infused into this art. 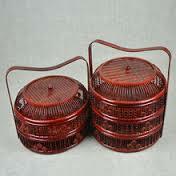 So, there are diverse varieties of these bamboo basketry products. Weavers of these products choose the appropriate bamboo materials based on the maturity of the bamboo, place where the bamboo grows, calibers of their ends, their lengths and colors. Once the appropriate bamboo materials are gathered, they are cut, split, scraped, divided, woven, dyed and lacquered to make the basketry products. These weavers must adhere to uniformity in the sizes of the products and so, they devote a lot of attention and time for making the finished products. Those who are engaged in this craft acquire the skills by observing their elders and they train and perfect their skills themselves. This folk craft mainly belongs to regions like Sichuan, Fujian and many other places like Zhejiang, Anhui and Taiwan where many families are engaged in this craft. Bamboo grows in abundance in all these areas. Bamboo hats and many other articles that are hand-woven in these places are exported to other countries also.